Randomised controlled trials with a long term follow-up (3 to 10 years) have demonstrated that mesh repair is superior to suture closure of incisional hernia with lower recurrence rates (5 to 20% versus 20 to 63%). Yet, the ideal size and material of the mesh are not defined. So far, there are few prospective studies that evaluate the influence of the mesh texture on patient's satisfaction, recurrence and complication rate. The aim of this study is to evaluate, if a non-absorbable mesh (Optilene® Mesh Elastic) will result in better health outcomes compared to a partly absorbable mesh (Ultrapro® Mesh). In this prospective, randomised, double blind study, eighty patients with incisional hernia after a midline laparotomy will be included. Primary objective of this study is to investigate differences in the physical functioning score from the SF-36 questionnaire 21 days after mesh insertion. Secondary objectives include the evaluation of the patients' daily activity, pain, wound complication and other surgical complications (hematomas, seromas), and safety within six months after intervention. This study investigates mainly from the patient perspective differences between meshes for treatment of incisional hernias. Whether partly absorbable meshes improve quality of life better than non-absorbable meshes is unclear and therefore, this trial will generate further evidence for a better treatment of patients. 70.000 incisional hernia repairs were performed in Germany in 2006 . Incisional hernias can cause serious complications such as incarceration or strangulation, resulting in substantial costs for further treatment (~ 128 Million €). Optimal treatment has not yet been defined [2, 3]. Currently, the surgeon usually implants a mesh to reinforce the abdominal wall. The use of a mesh prosthesis for incisional hernia repair results in a lower recurrence rate than suture repair [4–11]. Creating a tension free repair with a mesh reduces the recurrence rate to 5-10%. Studies performed by Israelsson et al. in 2006  and Kingsnorth et al. in 2004  showed that the sublay technique seems to result in a lower recurrence rate (3-7%) compared to the onlay technique (12-19%). In order to achieve a sufficient reinforcement of the abdominal wall, the mesh should overlap the defect more than 5 cm in all directions [13–15]. Several meshes are available which differ in material, textile structure, pore size, weight, elasticity, tissue reaction, biocompatibility, and absorption [16–22]. Patients react differently to the mesh and the materials cause different complications such as seromas, chronic pain, and infections [14, 15, 19, 23, 24]. The aim of this study is to evaluate the safety and efficacy of the Optilene® Mesh Elastic manufactured by B|Braun Aesculap compared to, the Ultrapro® Mesh by Johnson&Johnson. Surgeons currently use both meshes to repair incisional hernias [25–27]. The two meshes have large pores based on polypropylene. Optilene® Mesh Elastic is made of pure polypropylene and is not absorbable. Ultrapro® is a partly absorbable mesh (polypropylene plus polyglecaprone, table 1). The primary objective of the study is to compare the physical functioning score from the SF-36 questionnaire 21 days after insertion of either an Optilene® Mesh Elastic or an Ultrapro® Mesh. Secondary objectives include the evaluation of the patients' daily activity, pain, wound assessment determined on several occasions during the observation time, the incidence of specific post-surgical complications and safety. The study is a prospective, randomised, patient and observer blinded study. It is conducted in six centres in Germany. 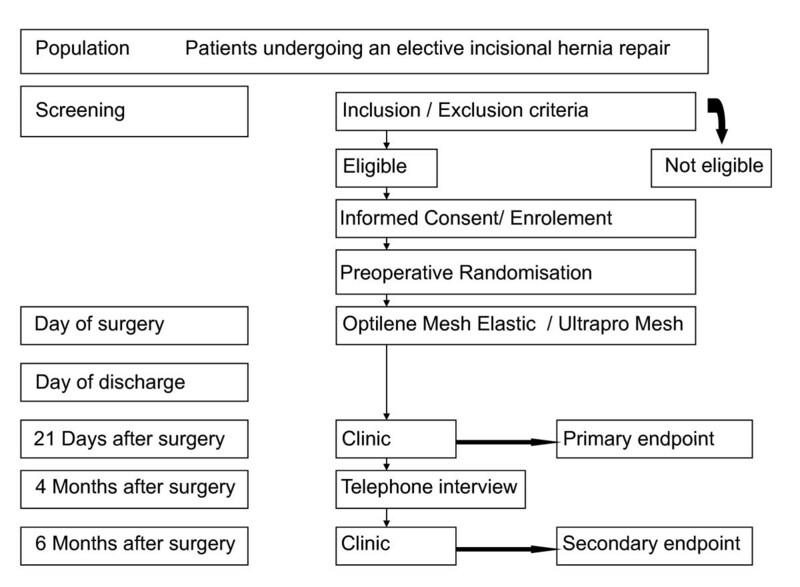 In total eighty patients with incisional hernia meeting the specific inclusion criteria will be randomised and followed for six months thereafter (table 2 and figure 1). Patients who prematurely terminate participation in the study will not be replaced. Female or male patients over 18 years old undergoing an elective repair for a midline incisional hernia are eligible for participation (table 3). The commercial regulatory authority Hannover gave its positive approval in February 2006. For the two centres in Heidelberg the Ethics Committee of the University of Heidelberg Medical School approved the final protocol on the 8th Oktober 2007 and on 20th November 2007. A central ethics approval was also obtain from the International Ethics Committee of Freiburg on the 4th May 2009. Written informed consent will be obtained from all patients participating in the trial. The study is conducted in accordance with the principles of the Good Clinical Practice (GCP) guidelines, the Declaration of Helsinki, and the European Standard EN ISO 14155 Parts I and II (2003), "Clinical Investigation of Medical Devices for Human Subjects". Patients will be randomised by opening sealed, opaque envelopes containing the mesh to be implanted. The sponsor will prepare envelopes with a balanced distribution of meshes, according to the randomisation plan. The meshes will be assigned to patients in each centre in chronological order. Neither the patient nor the observer will have access to the documents indicating mesh distribution. The surgeon should not be the observer of outcomes in this clinical trial. Therefore, at least two different persons per centre are involved in this study, one who performs the surgery and the other one conducting the follow-up examinations. Together with the meshes the study centres receive emergency envelopes with the information of treatment allocation. The sponsor has to be contacted before breaking the code for a given patient. In case of opening the envelope, time, date, name of the person opening and the reason for opening the envelope are to be documented on that envelope and in the corresponding CRF. In order to minimise bias and to assure parity in treatment for all patients, the following standardised procedures were implemented. The operation is initiated with a vertical median incision. After classification of the hernia according to Schumpelick, a space is created between both posterior sheaths and the rectus muscle. The posterior fascia is closed using a running monofilament non-absorbable suture. The mesh is placed in sublay position between the posterior rectus sheath and the rectus muscle with an overlap of the defect of 5 cm in all directions (figure 2). Whereby the largest elasticity of the mesh is in vertical direction. The mesh is then fixed to the posterior fascia using a single knot technique every 3 cm with monofilament, non-absorbable suture material. The closure of the midline anterior rectus sheath is conducted with a continuous running technique using monofilament, non-absorbable sutures with a 4:1 ratio (suture length: incision length). Two Redon drains are placed close to the mesh. The skin is closed with tacks and an abdominal bandage is applied. Sublay technique for open incisional hernia repair. The investigator will collect data in a CRF about the patient and perform six examinations (table 2). CRF are paper-based and will be entered into a database by two persons independently applying plausibility checks. Queries raised during data base input will be clarified with the investigators. The SF-36 Health Survey is a validated instrument to measure health status and patients are requested to complete the questionnaire before surgery, on day 21 after intervention and six months postoperatively. During surgery, the investigator documents the size of the incision, the device and the material used for fixation, intra-operative complications, classification of the defect, and the size of the overlap of the mesh. The observer will record wound assessment, daily activity and pain as secondary endpoints (table 2). The investigator has to document adverse events and serious adverse events on the appropriate form of the CRF which occur in the abdomen. Serious adverse events occurring during the study or within two weeks after discontinuation have to be reported to the sponsor within 24 hours of becoming aware of the event. It is the responsibility of the principal investigator at each centre to inform the local ethics committee of SAEs occurring at the centre according to local requirements. The primary efficacy endpoint is the change of SF 36 PCS between baseline and average of SF 36 PCS 21 days after intervention. The primary efficacy analysis will be conducted in the intention-to-treat population and applies a fixed effect linear model adjusting for age, BMI and SF 36 PCS before. Level of significance is set at 5% (two-sided). Due to the lack of any empirical data for the primary endpoint in the population under investigation, there is substantial uncertainty with respect to overall rate and treatment effect to be expected. As a consequence, the assumptions to be made for sample size calculation are highly uncertain and therefore, the study is performed as a pilot randomised trial with 80 patients. Secondary endpoints are level of function and daily activity, seroma formation, wound assessment, neuralgias, time to return to work and to normal activities, the patient's rating of pain, analgesic consumption and other SF-36 scores during 6 months after surgery. These data will be analysed descriptively. No confirmatory statistical testing will be done with regard to secondary endpoints. Details of the analysis of secondary outcome parameters will be documented before database lock in the analysis-plan. The safety assessments, including adverse events and serious adverse events, will be analysed descriptively. This study is initiated and sponsored by B|Braun Aesculap. Aesculap AG conducts it in cooperation with the CRO Dr. med. Lenhard&Partner GmbH. The CRO is responsible for monitoring, biostatistics and database. Aesculap AG is responsible for the project management. The sponsor supplies the participating trial centres with the meshes used in the trial. Aesculap AG is responsible for the registration (Identifier Number NCT 00646334, http://www.clinicaltrials.gov) and all trial related meetings. Data documentation and case report forms (CRF) will be reviewed for accuracy and completeness during on-site monitoring visits and at the sponsor's site. The first monitoring visit after the study initiation will be made as soon as the enrolment of patients has begun. On these visits, the monitor will perform source data verification, i.e. compare the data entered in the CRFs with the hospital records. The trial centres may be visited either by representatives of the sponsor or the local authorities to perform an audit. The first investigator meeting was held on 21st December 2005 in Tuttlingen, Germany. The study protocol for this trial was completed on 19th January 2006. In February 2006, following completion of contracts the first three centres (Hannover, Aschaffenburg, Northeim) were initiated, the first patient was recruited in July 2006. Due to slow accrual of patients three other centres (University of Heidelberg, University of Mannheim, Salem Hospital in Heidelberg) were initiated in December 2007. It is expected that the last patient will be randomised in November 2009. The study is estimated to be completed in June 2010. Incisional hernia is a common complication after abdominal surgery with a reported incidence between 11 and 20 percent [6, 8, 10, 28]. Such hernias can cause serious complications such as strangulation or incarceration [2, 3]. Many techniques are currently in use to repair incisional hernias. Primary suture repair has been widely used, but results in a high recurrence rate between 24% and 54% [5, 10, 29, 30]. With the development of new synthetic materials the use of prosthetic meshes has gained popularity in the treatment of incisional and ventral hernias . The mesh facilitates closure, minimizes tension on the suture line, and assures high wound strength [32, 33]. The use of prosthetic mesh is associated with a lower incidence of hernia recurrence, ranging from 2 to 36 percent [5, 10, 11]. A prospective, long-term, comparative study showed that, for both small and large incisional hernias, mesh repair was superior to suture repair in regards to recurrence . In addition the incidence and intensity of abdominal pain were also lower after mesh repair than after suture repair. Several trials have been performed in order to find the optimal mesh [19, 24, 34–37] and the ideal technique for implantation [13, 38]. The onlay and the sublay technique are used in open mesh repair [12, 13, 38]. Both techniques give good results but the sublay technique seems superior in regard to complications and recurrence rate. The inlay technique is nowadays rather rarely used [9, 12, 38]. The size of the prosthesis is also important for the recurrence rate of incisional hernias [24, 39–41]. The mesh should coverlap the defect more than 5 cm in all directions from the margin of the hernia, in order to achieve a sufficient reinforcement of the abdominal wall [13–15, 24, 41]. The manifold available meshes differ from each other in their material, in their textile structure and in their tissue reaction and absorption. Evaluation of the different meshes for incisional hernia repair is of special interest because they are different in their biocompatibility and complication rate. Pain, seroma and persisting infection are known mesh-related complications . Most studies showed a high incidence of seroma formation after mesh repair [5, 8, 10, 42]. But with conservative treatment most of these eventually resolve. The inflammatory activity of the mesh mainly depends on the amount of material and its textile structure [35, 43, 44]. In accordance, the majority of these problems are associated with small pore-sized, heavy-weight, meshes . In some patients, an excessive shrinkage of these meshes cause considerable complaints and even require a mesh change . To overcome this problem, another form of mesh was introduced the large pore-sized, light-weight mesh. They rarely cause severe mesh-related problems, due to their reduced amount of polymer [19, 24]. With these materials, patients report less pain, less mesh awareness and show less symptoms such as a "stiff abdomen" [19, 23, 24]. Partly absorbable meshes have also been compared with non-absorbable heavy-weight large pore-sized meshes [19, 24]. No difference in the incidence of wound infections and the rate and the volume of seroma were found [19, 24]. But these studies did not analyse the role of the absorbable and the non-absorbable part in causing complications . Currently most surgeons favour large pore-sized, light-weight, elastic, monofilament polypropylene meshes in the sublay position for reinforcement of the abdominal wall [14, 19, 23]. There are only few prospective studies that evaluate the influence of the mesh texture on patient's Quality of Life. So far no randomised controlled trial, which evaluates if the absorbable part of a mesh increases the rate of wound infections, pain, patients discomfort, and other complications after mesh implantation has been published. It remains unclear whether the application of partially absorbable components might contribute to improvement of the biocompatibility of polypropylene meshes and whether such improvement would decrease the incidence of wound infections or other complications. Therefore, this study was designed, focusing on patient related outcomes. Christoph Seiler, Petra Baumann contributed equally to this work. Recruitment is performed by the participating centres of the study (DRK Hospital Clementinen, Department of Surgery, Hannover, A. Kuthe MD; Albert-Schweitzer Hospital, Department of Surgery, Northeim J. Kuhlgatz MD; Clinical Centre of Aschaffenburg, Department of Surgery, R. Engemann MD; University of Heidelberg, Department of Surgery, C. Seiler MD; Hospital Salem, Department of Surgery, Heidelberg, M. v Frankenberg MD; University of Mannheim, Department of Surgery, P. Kienle MD. Aesculap AG, Germany, sponsors this study and its publication. PB and HPK (B|Braun Aesculap, Tuttlingen, Germany) managed and conducted the trial in co-operation with Dr. med Lenhardt&Partner GmbH. CS wrote the manuscript together with PB and HPK. All authors have read and approved this manuscript.